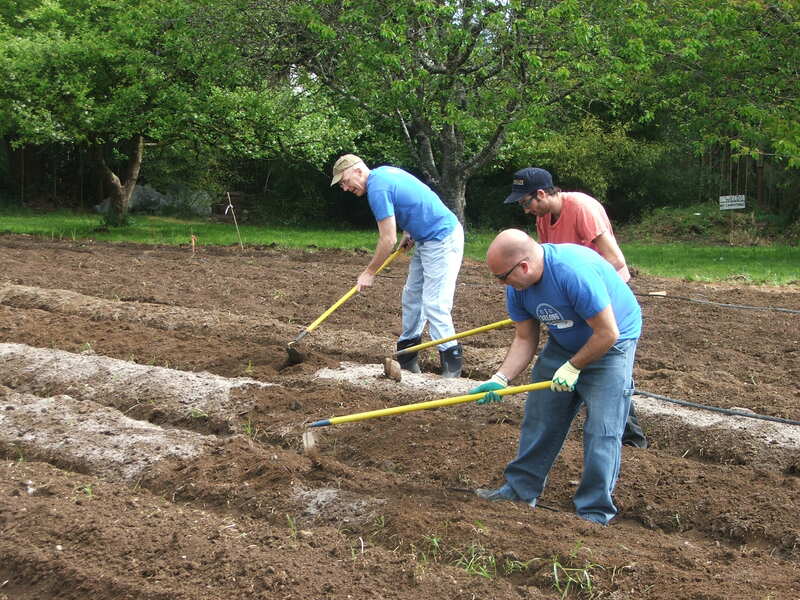 WSECU CEO Kevin Foster-Keddie gets dirty alongside member volunteers at GRuB. Husband and wife team Jonathan and Melissa Ferris love digging in the dirt. 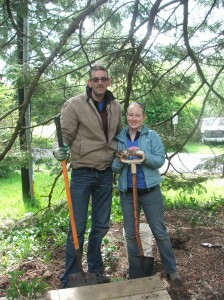 The couple was onsite at GRuB for a day of volunteering with other WSECU members. It was this call to action, along with the mention of volunteerism, which caught the attention of dozens of local WSECU members. As part of a recent community outreach campaign, WSECU has teamed up with GRuB (Garden-Raised Bounty), a local non-profit organization, to act as a springboard for members to give back to their community. While many companies invite their employees to volunteer in the community, not many have tried to tap their best resource – their customers, or in the case of the credit union, their members. When WSECU put out a call to its members to help GRuB, they responded positively. About 20 people, including half a dozen kids, showed up at GRuB headquarters Saturday morning for hours of digging, weeding, seeding and fertilizing. “I think the best part is learning about the farm and organization,” says 8-year-old Preston Gress, who aspires to be a farmer. Together with 3-year-old sister Claire, and mom, Crystal, they pull weeds and examine spiders. The family all bank with WSECU (the kids participate in the Munny Bunny savings program) and all are happy to help. Don and Carol Sittler, along with Nick Trautman and new friend Tony Irving, break from lively conversation and filling seed trays, to smile for the camera. Kerensa Mabwa, community engagement coordinator for GRuB, was also on site, weeding and talking with volunteers. “Many hands make light work,” says Kerensa, smiling while digging up a dandelion. “When businesses become ambassadors and help share that work, it allows outreach and engagement. So an event like this allows us to share excitement for our similar values,” add Kerensa. Member Kathy Goodwin is also glad to be helping GRuB. Near the flowering current and elderberry, two volunteers, Carol Sittler and Melissa Ferris, meet for the first time. They chat about building raised garden beds and how while giving back can be hard work, it has its benefits, too. “Playing in the dirt on a Saturday is always good,” laughs Ferris. “This is actually relaxing,” Sittler chimed in, noting her high-stress job providing low- and middle-income families with housing. They both agreed volunteering with WSECU is an activity they would do again. Out in the field, where potatoes and peas will grow, volunteers amend soil alongside WSECU President and CEO Kevin Foster-Keddie. “This is very exciting, I love working outside, and I love our members, we have very cool members,” he says, noting a conversation he just had about the prospect of growing mushrooms from coffee grounds. 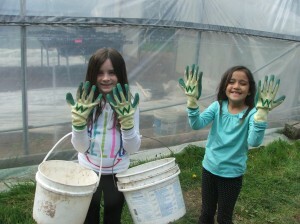 Alanna Kam, 8 and Mireya Parkin, 7, have fun volunteering with other WSECU member families at GRuB. And regarding the business part of the event? On another part of the farm, little girls tote buckets of weeds around. 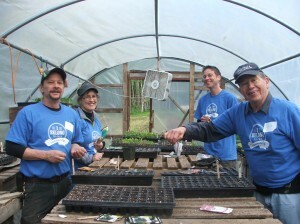 A group of members can be heard laughing in the greenhouse, where seeds are being sown, both literally and figuratively. There is Preston again, pushing the wheelbarrow around, earning his stripes as farmer-to-be. I make my exit as the group winds down for a break. Live bluegrass and snacks, plus the occasional sun breaks make the perfect setting, and smiles were all around. 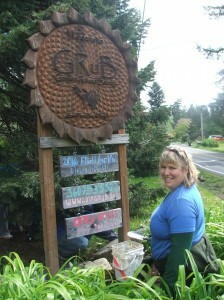 WSECU member Kathy Goodwin pretties up GRuB’s landscape during a volunteer event Saturday. 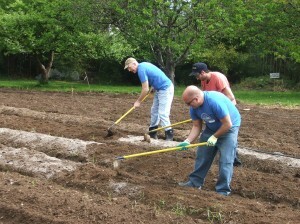 GRuB builds more than 60 food gardens (for free) for low-income families and individuals across Thurston and Mason Counties. 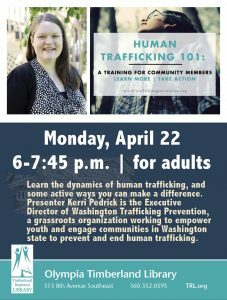 The non-profit organization hosts numerous workshops and events, offers a Community-Supported Agriculture (CSA), partners with the Olympia School District and more. Most recently, GRuB has started FIG (Food Investment Gardens) where they build gardens for people of all income levels on a sliding fee scale. A new fundraiser, developed by existing high school staff to help offset stipend costs (students gain credit, food and money through the program) is now live. WSECU is a not-for-profit credit union based in Olympia. Membership is open to anyone who lives or works in Washington State. 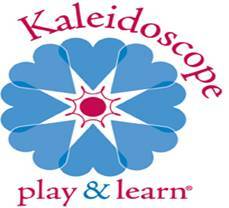 To learn more about WSECU, click here. To learn more about GRuB, click here.